Alongside standard wood finishes, Rawlins Paints stock a broad range of wood floor finishes designed to protect and decorate wooden floors in most environments. For commercial environments, such as in restaurants, bars, airports, gyms and cafes, we recommend floor oil, polyurethane varnish, quick drying floor varnish and heavy-duty floor varnish. These are all durable, protective and decorative options, with a range of brands and finishes on offer. We also offer some fantastic opaque wood floor paints that are becoming more and more popular in retail environments, thanks in part to the wide range of colour options to choose from. When deciding on the type of wooden floor to install, it’s important to consider not only how it looks but also the level of traffic the floor is likely to have to experience. You may need to consider a hard-wearing floor if it’s going to be walked on a lot, and it’s important to also consider maintenance. Public areas generally need to be easily maintained and be extremely long lasting. Blackfriar Polyurethane Floor Varnish provides your floors with a finish that is attractive, durable, and easy-to-clean by sealing the surface against dirt. Blackfriar Quick Drying Floor Varnish&nbsp;has been specially formulated to protect floors with an attractive, long-lasting scratch-resistant finish. 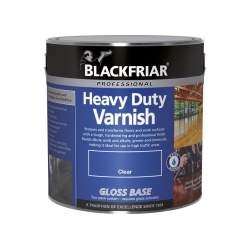 Blackfriar Heavy Duty Varnish is a two-pack wood and concrete varnish that protects and transforms floors and work surfaces with a tough, hard wearing and professional finish. Touch dry in 2 hours and hard dry in 8 hours, this product is for internal use. Mathys Plasti-Parket is a solvent based polyurethane alkyd varnish ideal for treating and protecting parquet floors and wooden stairs. Made from natural resins and fast drying oils which penetrate deeply into the wood filling the pores to form a wear and water-resistant surface. Used for periodic maintenance of floors treated with Timberex Natural, Timberex Heavy Duty or Timberex Coloured. Available in natural or white, re-sanding is not normally necessary. Used for periodic maintenance of floors treated with Timberex Gold, Timberex Free or Timberex Wax-Oil. A deep penetrating, hardening natural oil that is labour efficient and re-sanding is not normally necessary. A unique product for the easy maintenance of pre-oiled floors that will help remove marking and restore the surface finish. 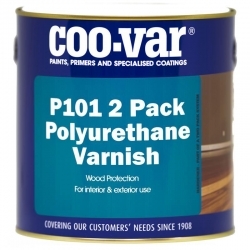 Coo-Var P101 2 Pack Polyurethane Varnish is a clear aliphatic polyurethane coating which provides a hard wearing protective coating for wooden floors, inside or outside. 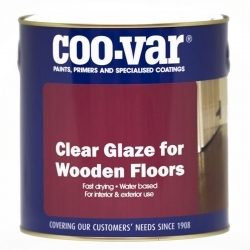 Coo-Var Polyurethane Clear Floor Coating is an oil based clear wood floor varnish which gives a hard glaze to protect most wooden floors and provide an easy to clean surface. Wooden floors are unquestionably beautiful and they’re a very popular choice for flooring surfaces, both in commercial and domestic environments. Installing a wooden floor in a home will need different considerations from one in a busy environment, such as a pub or restaurant, however. For general domestic and public use, Rust-Oleum's chalky finish floor paint works well on wood, concrete and other previously painted surfaces. 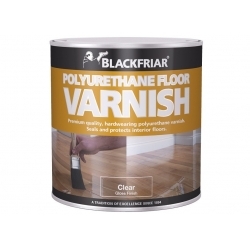 Blackfriar Polyurethane Floor Varnish is one of our attractive and durable floor coverings. It’s a clear floor varnish for use on most floor surfaces, including plywood, hardboard, chipboard and cement. It works by sealing the floor against any dirt and, once dry, is very easy to keep clean. It’s a good low-maintenance option and is extremely tough. A solvent-based solution, Mathys Plasti-Parket is perfect for protecting wooden stairs and parquet floors, so it’s a good option for any high-quality home transformation. You’ll need at least two coats but it’s very easy to use and offers long lasting resistance against abrasive damage on your floor surface. 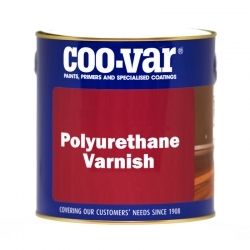 Coo-Var P101 is also a clear polyurethane coating for wooden floors inside and outside. Coo-Var varnish is ideal for wooden floors that have a lot of wear, so it’s great for dance studios, gymnasiums, bar tops, dance floors and sports courts. It can also be used over compatible paints to provide a glaze finish over a colour. Another option for a quick drying, water-borne polyurethane clear floor varnish is Jotun Trestjerne Parkettlakk. This is best used on wooden laminate and parquet floors so it’s an excellent product if you’re looking to make your wooden floors look great for the long-term. It also contains a UV-filter which protects the parquet or laminate against discolouring. It’s not appropriate for solid wooden floors but if you’re unsure of the best choice then please contact our Technical Team for advice. 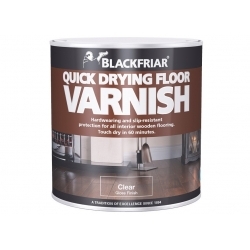 If you’re sprucing up a floor that needs to dry fast, then try Blackfriar Quick Drying Floor Varnish. Its specialist formula only takes an hour to dry, but offers scratch resistant and hard-wearing floor protection. It’s possible to revamp your floors in just a single day using quick dry floor varnish. Timberex Free is made from natural oils and resins which are designed to penetrate deep inside the wood. It protects the flooring from within and works as a floor sealant. It’s great for commerc­­ial use, and works well on large expanses of flooring. Timberex oil gives a deep satin sheen finish and brings out any grain patterns in the wood. If you prefer a high gloss sheen, it can be buffed easily. Timberex has a wide range of wooden floor oils, including Timberex Natural and Timberex Gold. We also stock various Timberex wooden floor surface maintenance products, including Satin Oil and Satin Oil Gold Mousse. Both products are designed for easy maintenance of wood floor surfaces that have been treated with other Timberex products. The floor oil mousse helps to remove marks and spruce up the surface for a long-lasting finish. If you’re looking to make a design statement and want a range of fashionable grey shades for your oak wood floor, try Timberex Active Stain. There’s a range of greys to choose from and they all stain deep into the wood to provide a long-lasting finish. You only need to apply Active Stain once and then use a topcoat to finish off. For those who’d rather retain the natural ‘wood’ look, Timberex Aqua is a range of water-based stains that also penetrate deep into the surface and protect against stains and traffic. There are seven main colours in the range but they can be mixed to create a range of looks. Timberex Coloured is made from natural resins and oils, as well as colouring agents. These all penetrate the wooden floor deep down and form a water resistant protective surface. There are ten colours in the range, each one designed to enhance the appearance of the wood.